Yesterday we had a very nice group, mostly from United States to the lovely town of Piran and its countryside. The tour started with a gentle scenic ride towards Piran, where our professional and multilingual guides took a guided walk through the widening streets of Piran. Its charm, that preserves the Mediterranean vibe and lifestyle is a perfect starting point to discover the region of Slovenian Coast. Next stop was a village, that preserves its traditional lifestyle and land cultivation. Known for the olive oil production from the orchards that are expanding on the slopes just before entering. The views expand from the valley to the hills dotted with vineyards. 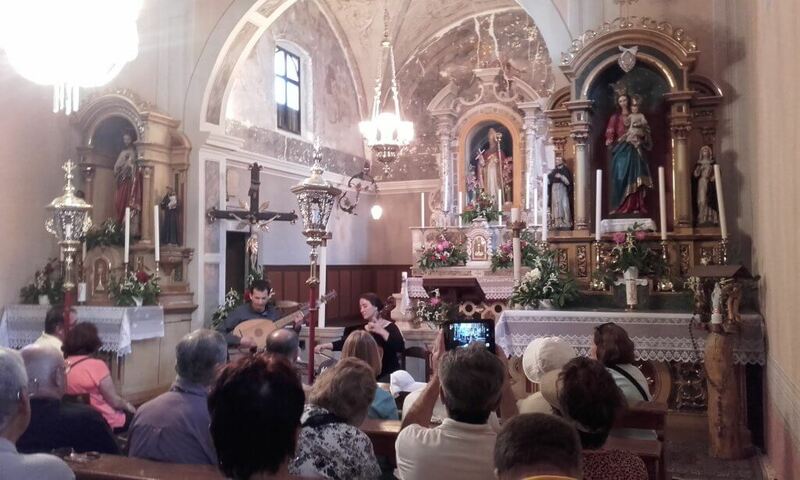 The tour explored the village and the church of St. Blasius, where a pleasant surprise was organized for the guests, a classical duo performance, by academic musicians. The program was executed with the attention to the overall detail. After the surprise performance and addition to the tour, the guests were free to sample the local delicacies at the farmer’s market. The offer was enriched with juicy fresh seasonal fruits such as strawberries and cherries with delicious pies and cakes. The local families are keen to welcome the guests into their local community. With different stalls the presentation of the produce is a perfect example of local heritage.